Sawarne produces Select Knotty grade boards with sound and tight knots. Our strict production standards ensure other natural growth characteristics are limited so they do not detract from the intended end use. 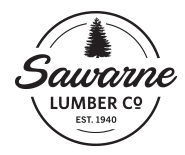 Sawarne’s Standard & Better boards are suitable for exterior construction. Trimming lumber of this grade may be required to yield aesthetic qualities that are suitable for your intended end use.